I came accross a puzzle on a family weekend and decided it would be a fun challenge to ask my computer to solve it. 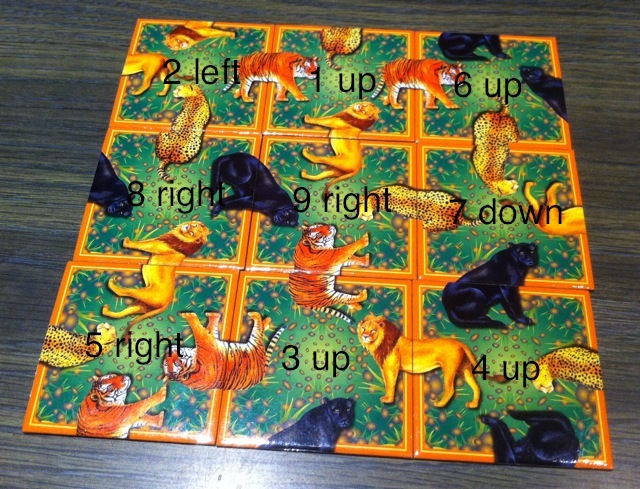 The aim of the puzzle is to find a 3x3 grid arrangement of the 9 tiles where the animals' heads and tails match between each adjacent tile. This was also an exercise to refresh my memory of Prolog from my Comp Sci degree. My first step was to describe the tiles to Prolog. I randomly arranged the tiles in a list and give each one an identification number (writing on the back in pencil). 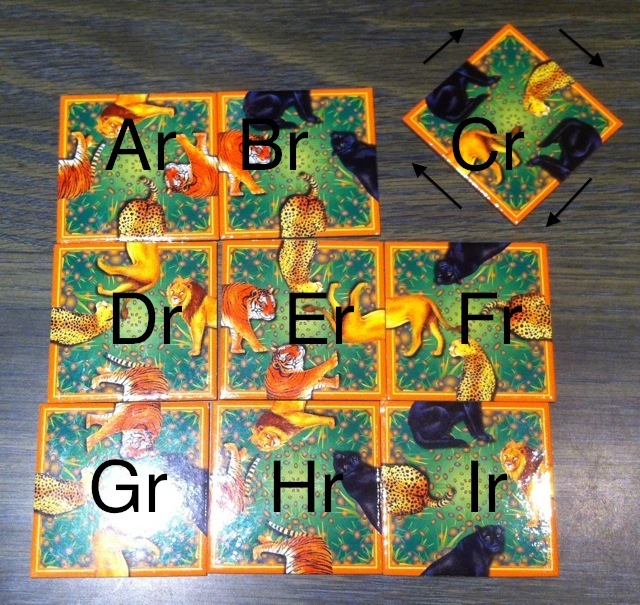 The format is: tile(number, top, right, bottom, left). 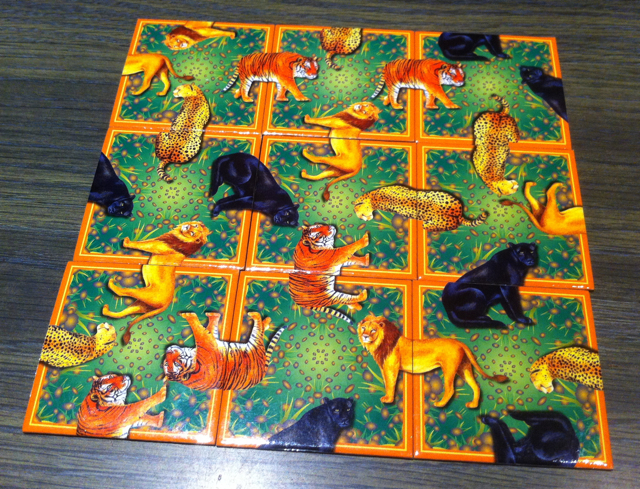 tile(1, cheetah_tail, tiger_tail, lion_head, tiger_head). 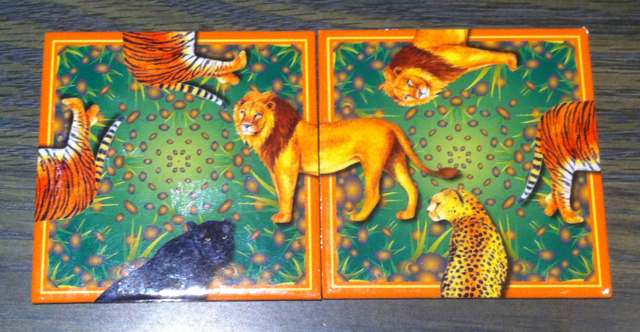 tile(2, lion_tail, lion_head, tiger_tail, cheetah_head). tile(3, tiger_tail, lion_head, panther_head, tiger_tail). tile(4, panther_tail, cheetah_head, panther_tail, lion_tail). tile(5, tiger_head, tiger_head, cheetah_head, lion_tail). tile(6, panther_tail, panther_head, cheetah_tail, tiger_head). tile(7, panther_head, cheetah_tail, cheetah_head, lion_tail). tile(8, panther_tail, lion_head, panther_head, cheetah_tail). tile(9, cheetah_head, tiger_head, panther_head, lion_tail). A computer and Prolog have no understanding of animals, lions, heads or tails. So I needed to state (as facts) the valid matches between heads and tails. You can read the fact match(lion_head, lion_tail). as "a match is between lion-head and lion-tail" or "lion-head and lion-tail is a match". I listed all the correct matches for the puzzle. To desctibe the 3x3 grid to Prolog, I identified each position (not tile) in the grid with the letters A-to-I. Each tile in each position can also be rotated (relative to my tile descriptions at the start): up, down, left, and right. The variable-set [Ar, Br, Cr, Dr, Er, Fr, Gr, Hr, Ir] ("r" for rotation) represents every possible rotation of every tile in its row or column. I reduced the grid into a description of rows and columns. col(C, F, I,  Cr, Fr, Ir). 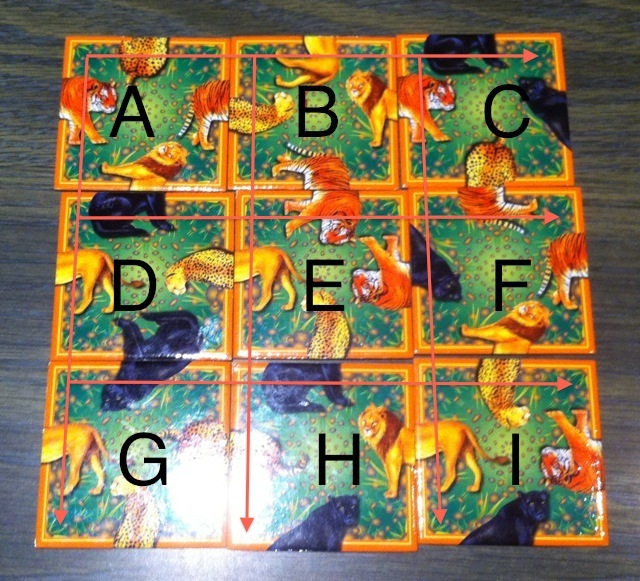 The solution to the puzzle has rows (and columns) where the animals' heads and tails match (A-B and B-C as pictured). I reduced the row into a match between tiles A-B and tiles B-C. Since match-left-to-right is logically identical for both, the B-C match reuses the same rule. My match_left_to_right rule states that there is a match if the right-edge (AB) of the left rotated-tile (A) matches the left-edge (BA) of the right rotated-tile (B). rotated_tile(Tile, Top, Right, Bottom, Left, up) :- tile(Tile, Top, Right, Bottom, Left). rotated_tile(Tile, Top, Right, Bottom, Left, right)  :- tile(Tile, Right, Bottom, Left, Top). rotated_tile(Tile, Top, Right, Bottom, Left, down) :- tile(Tile, Bottom, Left, Top, Right). rotated_tile(Tile, Top, Right, Bottom, Left, left)  :- tile(Tile, Left, Top, Right, Bottom). % tile(number, top, right, bottom, left).